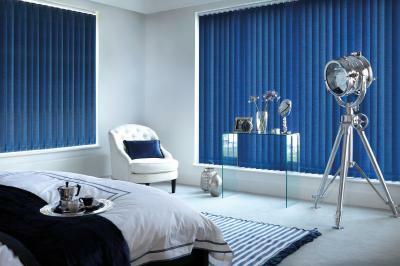 Vertical Blinds are considered by many to be the most practical window coverings. Unlike venetian blinds, dust does not accumulate easily on vanes, so they are easy to clean. The sleek, contemporary styling of vertical blinds complements a variety of windows, especially larger windows and patio doors. Available in an array of designer fabrics and durable textured vinyl vanes, vertical blinds beautifully satisfy most decorating styles. Plus, the high-quality track system ensures smooth traversing and trouble-free operation for years to come. Light and Privacy Control - The beauty of vertical blinds is the ability to adjust vanes and control the amount of incoming light, as well as its direction. Blinds may also be drawn completely open for a totally unobstructed view and closed for light and privacy control. There are many colours and patterns available to choose from, including pvc vanes if total privacy is required. A spectacular array of fabrics in plain, textured or jacquard weave types. Dimout, blackout, PVC (rigid and flexible) and fire retardant versions are available.